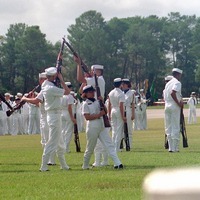 A rifle drill team performing during the graduation of a co-educational recruit company at Naval Training Center (NTC) Orlando. NTC Orlando was in operation from 1968 to 1998 and was one of three recruit training centers used by the U.S. Navy. It resided in the area that is now the community of Baldwin Park. During the 30 years that NTC Orlando was operational, more than 650,000 men and women were transformed from civilians to sailors. Beginning in 1973, NTC Orlando became the Navy's only co-educational recruit training center. Following an intense eight week training program, the various companies would march along the vast field know as the "Grinder" and pass before the base commanders for review. This ceremony would mark the completion of their transformation from civilians to sailors. Original color photographs, 1992: National Archives at College Park, U.S. Department of Defense. 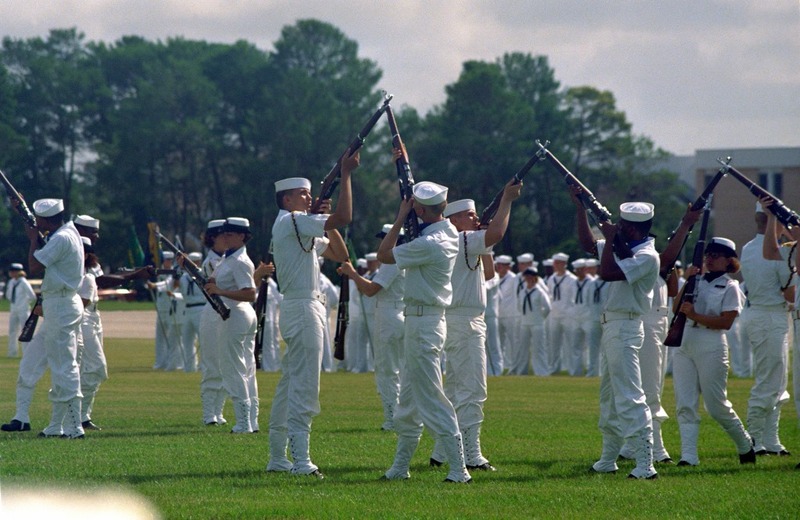 Digital reproduction of original color photograph, July 24, 1992: "A drill team, part of a co-ed recruit company, performs during their unit's graduation ceremony at the Naval Training Center. 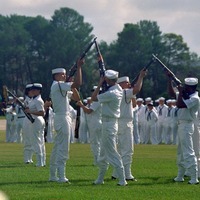 Recruit Training Command, Orlando, is the only Navy command where both men and women undergo basic training, 07/24/1992." Image 6476849, Combined Military Service Digital Photographic Files, National Archives at College Park, U.S. Department of Defense. Digital reproduction of original color photographs, 1992. Combined Military Service Digital Photographic Files, National Archives at College Park, U.S. Department of Defense. Lone Sailor Navy Memorial History Project Collection, UCF Community Veterans History Project Collection, RICHES of Central Florida. Originally created by the Defense Visual Information Center, American Forces Information Service, U.S. Department of Defense. Copyright to this resource is held by the Defense Visual Information Center, American Forces Information Service, U.S. Department of Defense and is provided here by RICHES of Central Florida for educational purposes only. Dobie, Kathy. "A Few Nice Men. (using Coed U.S. Navy Boot Camps to Reduce Incidence of Sexual Harassment)." Vogue 183, no. 2 (1993): 234–37, 299. "The History</a." Navy Memorial of Central Florida. http://www.lonesailorfl.com/. "The History." RTC Orlando. http://rtcorlando.homestead.com/. Defense Visual Information Center, American Forces Information Service, U.S. Department of Defense. 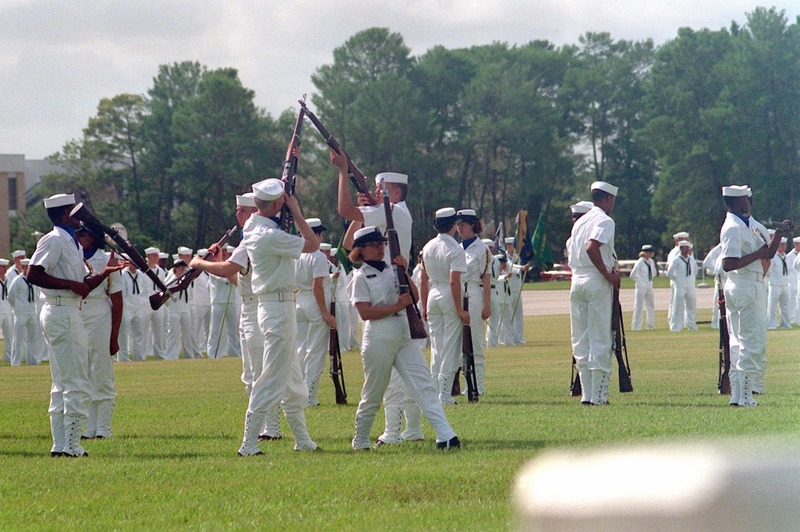 “Rifle Drill Team at Recruit Training Center Orlando.” RICHES of Central Florida accessed April 23, 2019, https://richesmi.cah.ucf.edu/omeka/items/show/4128.